The set is equipped with thermal and overcurrent protection. The circuit breaker tester CBPOB30D is easy to use and has accessory cable-set with touch-proof contacts. The CBPOB30D has very high ability to cancel electrostatic and electromagnetic interference in HV electric fields. It is achieved by very efficient filtration. The filtration is made utilizing proprietary hardware and software. The circuit breaker tester CBPOB30D have built-in capability to perform an automatic test of minimum trip-voltage. 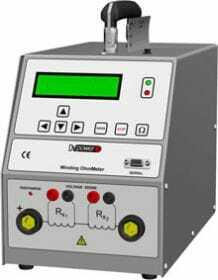 The minimum trip-voltage test is described in a number of international and national standards such as IEC 62271-100, ANSI C37.09 etc. Many other important parameters are possible to test with a breaker analyser. CBPOB30D is then used as a power supply unit. 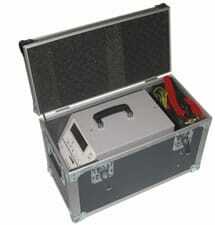 It is compatible with breaker analysers from different vendors. CBPOB30D can also be used as a general power supply unit or a temporary battery charger. 1. Make certain that the mains are de-energised on both sides of the breaker, safety grounded and that local safety regulations are followed. 2. Connect Power supply unit CBPOB30D to the breaker's coil circuit. 3. Set the minimal test voltage. 4. Set the step voltage. 5. Set the maximal voltage.